by Manus O’Riordan, Executive Member for Ireland International Brigade Memorial Trust and SIPTU Head of Research. UNVEILED 29-12-07 BY PÁDRAIG Ó MURCHÚ, INISTIOGE. A memorial booklet was compiled, edited and designed by Committee member Terry Bannon, and entitled “George Brown 1906-1937: Working Class Activist and Member of the XV International Brigade in the Spanish Civil War”. 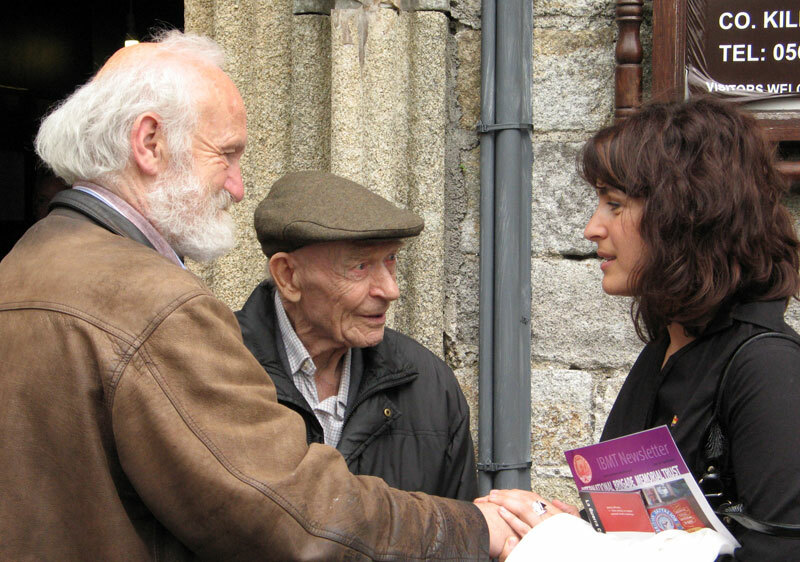 This booklet was launched by Bob Doyle, the last surviving Irish member of the Fifteenth International Brigade, in St. Mary’s Church of Ireland, Inistioge, on 27th June 2008. 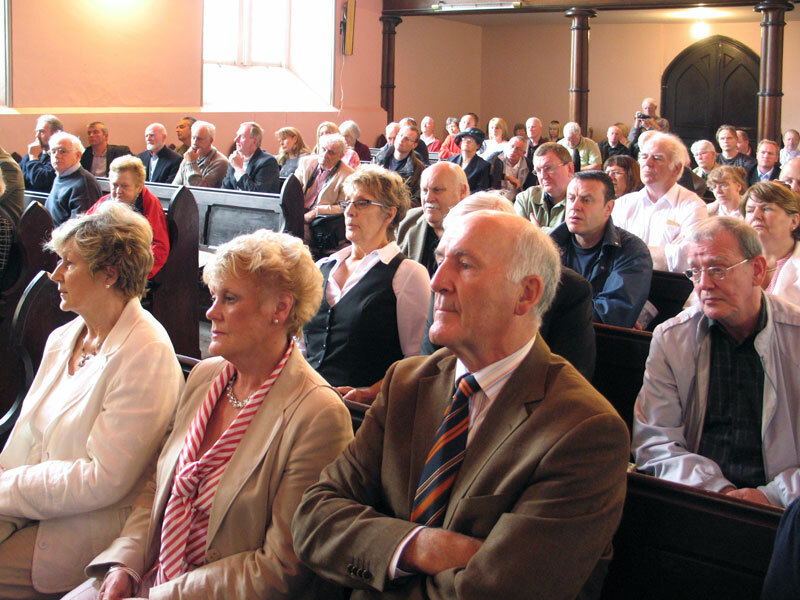 Joe Doyle, Chairman for the evening’s events and PRO and Treasurer of the George Brown Memorial Committee, thanked the Church of Ireland community in Inistioge for the use of their place of worship over the two days of the commemoration, where indeed some of George Brown’s own ancestors would themselves have worshipped. Still more of Brown’s ancestors would have worshipped in the adjacent Catholic Church of St. Colmcille. 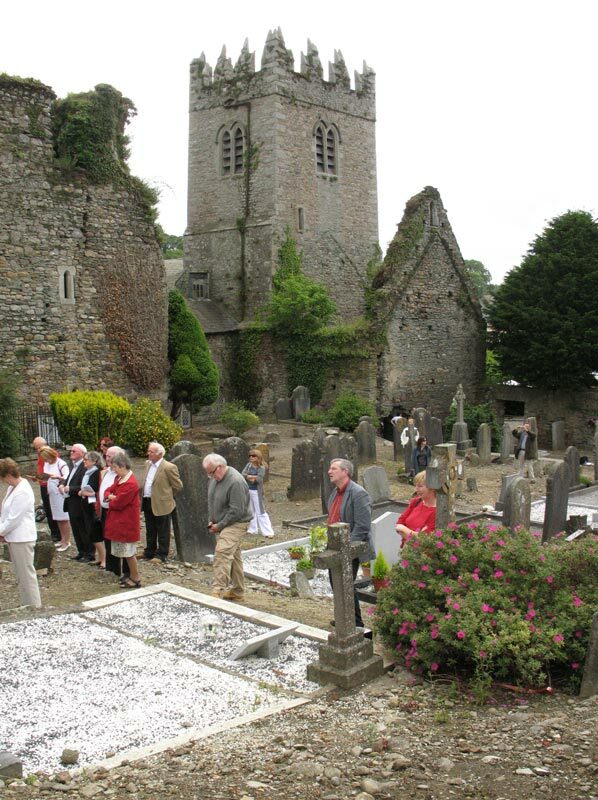 The Brown family graves are in the cemetery that adjoins both churches and which has long been shared by both the Catholic and Protestant communities of Inistioge. 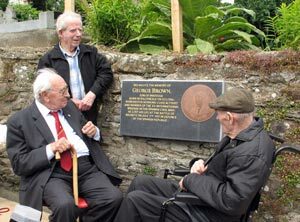 A Memorial Plaque to George Brown himself would be unveiled on the following day by his fellow International Brigader Jack Jones on a cemetery wall facing those same Brown family graves. Chairman Joe Doyle alluded to some of the Church’s own memorial plaques and how some things never change, with one plaque commemorating a 19th century military death in the Afghan capital of Kabul. But another thing that also has never changed is the life-long commitment of International Brigader Bob Doyle (no relation) to struggles of a different kind. He therefore called upon Bob to launch the George Brown Memorial Booklet. We are here today to honour George Brown and the many others from Ireland and other countries who went to Spain to fight Fascism. 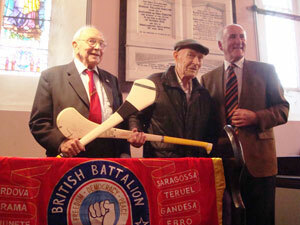 As the last Irish soldier of the International Brigades, I am honoured to open this commemoration in his native county. I was born in 1916 in the Dublin slums, and joined the IRA in my teens. In 1934 I left the IRA to join the Republican Congress set up by Peadar O’Donnell, Frank Ryan and Kit Conway. The time had come to support the fight of tenants against landlords, of workers against anti-union employers, and to take on the Blueshirts in the streets. We were still Republicans, but now we were social revolutionaries also. Had we stayed in the IRA as it was then, many of these employers and landlords would have still supported us and the IRA’s purely nationalist policies. We had to form coalitions with groups who might have differed from us in the past but now shared our campaigns for social justice and fighting the rising tide of Fascism. In 1936 we realised that this struggle was being fought even more critically elsewhere, especially in Spain. 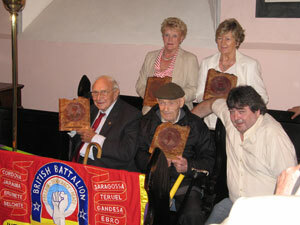 This is what led me and my ex-IRA comrades to join the International Brigades. We were with volunteers from 53 countries who also saw that their fight was the same as the Spanish people’s: our slogan was “Bombs on Madrid mean bombs on London” and as I saw for myself, this slogan was proved all too true. With the betrayal of the Spanish Republic by Britain’s Tory Government and their French and American allies of big business, Hitler, Mussolini and Franco won the war in Spain. Six months later the Second World War began, and bombs began to fall on cities everywhere, as they still do today. Yet despite the Allied victory in 1945, we now find that Fascism, raw Capitalism, is thriving, and using spin doctors instead of the old racist speeches, while more powerful weapons are being developed, supposedly to protect us, and our environment is in crisis. This crisis cannot be solved by Capitalism, because Capitalism is now its cause. My generation’s vision of a world without exploitation, where we live in harmony with our environment, seems as distant as ever, while Globalisation, which is the worldwide triumph of money over organised workers, undermines our democracies. The fight today is as vital as it was in Spain, but remember we are fighting for an idea, and though we must at times defend ourselves, guns cannot impose an idea: the four weapon of victory today are – Education, Organisation, Civil Disobedience and Unity. From my lifetime of struggles, these are the lessons which I have learnt. Take up the fight, and let us fight together, for the Liberation of Mankind. La lucha continua. The Chairman next called upon Manus O’Riordan, SIPTU Head of Research and Executive Member for Ireland of the International Brigade Memorial Trust, to deliver the first George Brown Memorial Lecture. It is indeed a great honour to be delivering the first George Brown memorial lecture here in Inistioge this evening. Little did I then know – when I was a young teenager present in Croke Park in both 1963 and 1969 to see Kilkenny’s illustrious and outstanding hurler Eddie Keher win two of his six All-Ireland Championship medals - that I would have occasion to be speaking here in Eddie’s own home village four decades later! Still less did I know that, through my future wife Annette, I would acquire in-laws in this locality, the Hennessy family of Glensensaw. And it was beyond all foreknowledge that, as the son of an Irish International Brigader here to honour his fellow Brigader George Brown, I would in fact also be honouring a close relative of that self-same Eddie Keher [a first cousin, once removed: George Brown’s father was the brother of Eddie Keher’s maternal grandfather]. Jack Jones fought alongside my own father Michael O’Riordan in the 1938 Battle of the Ebro, where they were both wounded. Following his return from that war, Jack and Evelyn were indeed married and went on to share a lifetime of love, comradeship and struggle, until Evelyn’s death ten years ago. I am, therefore, extremely delighted that among the Jones family party present here with us this evening are the two sons of Jack and Evelyn, Jack Jnr and Mick. And so it was - when speaking a month later at the launch of Bob’s autobiography “Brigadista” - that I introduced myself as the son of the runner-up! I am very pleased that so many deceased International Brigaders are represented by family members at this commemorative weekend. My own father is additionally represented by my sister Brenda. Waterford International Brigader Frank Edwards is represented tonight by his son Seán. Belfast Brigader Gerry Doran will be represented tomorrow by his daughter Anne, who is travelling over from Glasgow with other family members. 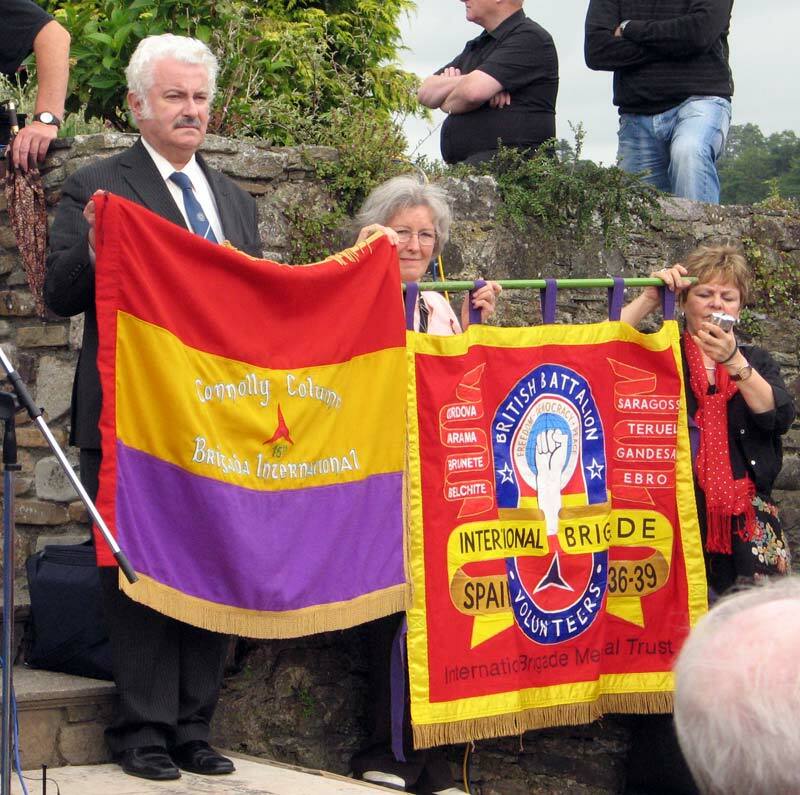 The last commander of the International Brigade’s British Battalion, Manchester-Irishman Sam Wild, is represented here by his daughter Hilary, while fellow Manchester Brigader Sid Booth will be represented tomorrow by his daughter Pat. 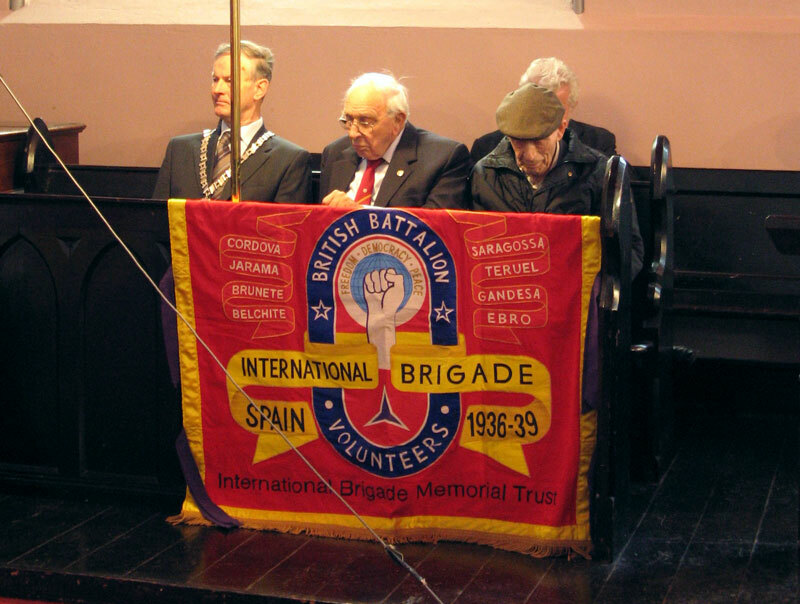 Also present on behalf of the IBMT are our Secretary Marlene Sidaway, partner of the late Brigader David Marshall, and our Treasurer Pauline Fraser, daughter of Brigader Harry Fraser. 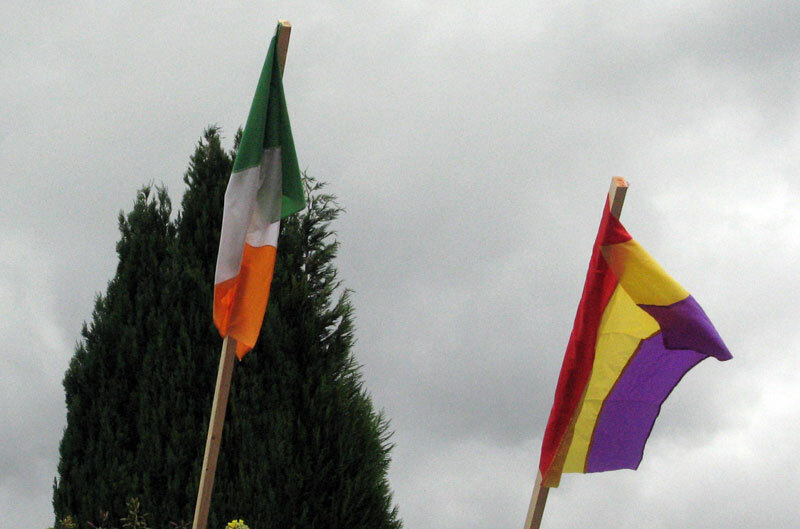 Friends, my purpose here tonight is to give you an insight into some of the key issues that motivated a variety of Irish International Brigaders to fight for the Spanish Republic. More of the historical backdrop to that conflict will be given in this Church tomorrow by Harry Owens in his lecture on the Spanish War itself. I will therefore restrict myself to these basic facts. In February 1936 the people of Spain voted into office a liberal democratic Government, giving the parties of the Popular Front 269 seats, an absolute majority of the total of 480 seats in the Spanish Parliament. In July 1936 General Franco launched an armed rebellion against the Spanish people’s democratic choice, and in this he was assisted, from the word go, by the armed forces of Hitler’s Germany and Mussolini’s Italy. International Brigaders from across the world, among them 300 Irishmen, rallied in turn to defend the Spanish Republic against the forces of European Fascism. As for those who volunteered to go to Spain to fight, the wording of the plaque being unveiled here this weekend is broad enough to encompass both strong and weak, because we know what it cost each and every one of them to take the stand they did. It is dedicated to all those volunteers prepared to take such a stand against Fascism. But we in the IBMT are also pleased to note that this very wording is unequivocally solid enough to exclude any honours for the type of man who claimed to have been the very first Irish volunteer - Charlie McGuinness of Derry – and who initially did go out to Spain, but when offered the opportunity to actually fight for the Republic, he promptly returned home in December 1936 and during that very month, while the first Irish International Brigaders were already being killed in action, he commenced his production of such scurrilous, but all too influential, Fascist propaganda for the “Irish Independent”. Éamon McGrotty was that Derryman’s name. I remember accompanying his late brother John, in both 1994 and 1996, to the mass grave of 5,000 where Éamon is buried near Jarama; how John brought clay from their parents’ grave to mix into that mass grave and brought some of Jarama’s clay back to their grave; how he carried his brother Éamon’s own missal with him on both occasions; and how he retold the double hurt experienced by his family when they sought to have a Mass said after Éamon’s death in February 1937 and the Bishop of Derry refused them, saying that a Mass would be no benefit whatsoever to Éamon, as he was “now in Hell”. McGuinness’s dirty work had borne fruit. 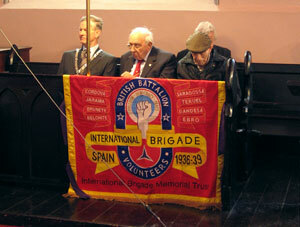 The International Brigade drew volunteers from both North and South. In the North they came from both the Catholic and Protestant communities, from political traditions that were variously Republican or Unionist, Communist or Independent Labour. The volunteers who hailed from the South were all Irish Republicans in the Wolfe Tone tradition – Catholic, Protestant, Jewish and atheist. I will name but a few. Bill Scott from a Dublin Protestant working class tradition that had seen his father fight as a member of the Irish Citizen Army alongside his leader James Connolly in the 1916 Rising. Frank Edwards - a Waterford teacher already victimised by the Christian Brothers when sacked from Mount Sion School in 1935 – who, on his return from Spain, found himself blacklisted by Catholic schools for his Spanish Republicanism and by Protestant schools for his Irish Republicanism, but who also found that the one and only school prepared to employ him was Dublin’s Jewish National School. Frank had been born in Belfast in 1907 to a Catholic family that was subsequently forced out of its home by sectarian conflict and then settled in Waterford. On the outbreak of World War One, Frank’s father enlisted in the British Army and perished during the course of that war. Frank’s elder brother Jack took a different course. He was the chief organiser in Waterford of the one-day general strike in April 1918 that prevented the British Government from imposing military conscription on Ireland. He subsequently fought in the Irish War of Independence and took the Republican side in the Treaty War that followed. He was captured by Free State Government troops in mid-July 1922. What next happened to his brother Jack was to leave a deep and lasting impression on Frank Edwards, as he himself would recount: “He was taken to Kilkenny Jail where, after a few weeks, he was shot dead by a sentry on the 19th of August. It was known to be a reprisal for the shooting of a Free State officer in Waterford. Someone called Jack to the window of his cell. A sentry had his rifle pointed and fired it. ‘Shot while attempting to escape’, they said, but we knew differently. I went to Kilkenny to claim his body.” Seán Edwards, with us here tonight, is in fact named for his Uncle Jack. Bob Hilliard himself would in fact join the IRA during the Treaty War, resulting, not unsurprisingly, in his expulsion from Trinity. He would, however, later return there to study Divinity. He was involved in two revivals of the Trinity College Hurling Club, in 1922 and 1931, and he himself actually hurled for the team during both periods. But it was as a boxer that Hilliard first became best known, being Irish bantamweight champion in both 1923 and 1924, and going on to represent Ireland at the 1924 Olympics in Paris. In 1930 Hilliard returned to boxing again, becoming Irish featherweight champion in 1931. By this stage Bob Hilliard’s nickname was that of “the Fighting Parson”, as he had by now become a Church of Ireland pastor. He had also moved North in his ministry. In 1931 he served as curate in Christ Church, Derriaghy, and in 1972 that Church was presented with a communion chalice, paten and cruet in his memory by a fellow International Brigader, Joe Boyd, who was himself an agnostic. After he had been appointed to the Belfast Cathedral Mission in 1933, Hilliard became greatly radicalised by the social upheavals in that city during this period. Personal problems saw him subsequently leave for London, where he became even more radicalised in later years, volunteering for Spain in December 1936. When I first had the opportunity of meeting Bob Hilliard’s daughter Deirdre in March 2005 she was carrying both of these items of her father’s correspondence with her. We have already seen how the man who claimed to have been the very first Irish Volunteer in Spain, Charlie McGuinness, rejected that call as soon as he could and dishonoured himself by immediately going into the service of Fascism before the end of 1936. 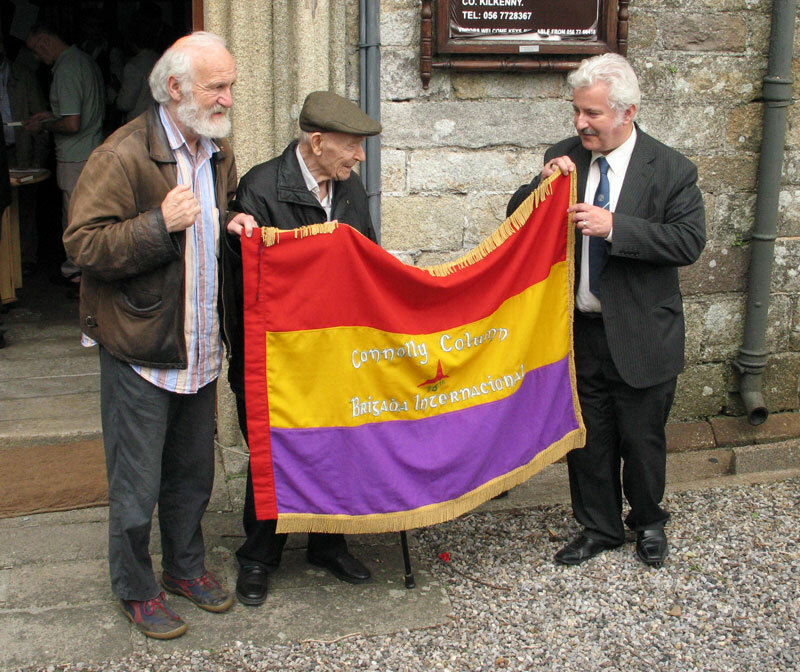 But tonight we will honour by name the very last International Brigade volunteer from Ireland who joined in May 1938 – a man who saw no conflict between his anti-Fascism and remaining true to his Catholic faith throughout the whole course of his life. That man was an Ulsterman - James Patrick Haughey from Lurgan, Co. Armagh – who fought shoulder-to-shoulder with both my own father and Jack Jones in the Battle of the Ebro during July and August 1938; and who was captured and imprisoned that September, ending up where Bob Doyle had already been imprisoned for the previous six months – in the Fascist concentration camp of San Pedro de Cardeña. Haughey was to continue his struggle against Fascism as a member of the Canadian Air Force during the Second World War. As with the letters of the Reverend Bob Hilliard, the following letter written from Canada after Haughey’s release from that Fascist Hell brings us still closer to the great humanity of all such volunteers. “Give my regards to everyone … I pray for you all every night and ask Mummy to watch over you and take care of you. I hope and trust that you don’t forget me in your prayers. Jim Haughey was to be killed in a plane crash on 12th September 1943. On 31st October 1943 “The Times” of London posthumously published Jim’s poem – simply entitled “Fighter Pilot” - over the name of Séamus Haughey. These verses have echoes of the WB Yeats poem “An Irish Airman Foresees his Death”, but possess the greater authenticity of being the actual premonitions of a real airman, rather than Yeats’s attribution of his own imagined thoughts to Robert Gregory. Amid the bubbles transient as my name. I scatter my last chips, and go my way. They only lead to Winter’s barren pain. For Spring, however spent, comes not again. Tonight we do more than mention his name in passing. And, of course, we particularly recall the name of a neighbour’s son, George Brown. And this brings me back to my last meeting with Evelyn Jones, when both she and Jack attended the 1991 Delegate Conference of the Irish Congress of Trade Unions in Killarney. During a break in proceedings, I drove Jack and Evelyn out to the Co. Kerry village of Kilgarvan, birthplace of International Brigader Michael Lehane, who was later killed by a Nazi German torpedo during World War Two, while serving with the Norwegian Merchant Navy. As we paid silent tribute at the Lehane memorial that had been unveiled by my own father two years previously, it was a particularly poignant moment for Evelyn. For Mick Lehane had fought side by side with both of her husbands – with George at the Battle of Brunete and with Jack at the Battle of the Ebro. As we drove on towards Kenmare and took the mountain road back to Killarney, I informed Evelyn that, in August 1989, Annette’s uncle, Luke Hennessy of Glensensaw, had brought me to see the actual birthplace of George Brown. We had walked up a country boreen [or maybe, speaking here tonight, I should use the South Kilkenny dialect of Irish and say “bosheen”! ], situated just outside the neighbouring village of Ballyneale, to see the ruins of the original Lackey home. Afterwards, Luke also introduced me to a member of the Lackey family still living in the Ballyneale area. Evelyn was indeed very much delighted to hear that George’s name continued to be remembered in his birthplace. George Brown’s mother, Mary Lackey, hailed from Ballyneale, while his father, Francis Brown, was a blacksmith from Inistioge. Although both were Irish emigrants who had married and settled in Manchester, Mary decided to return home to Ballyneale for the birth of each of her first four children. It was here that her fourth child, George Brown, was born on 5th November 1906. George was educated, earned his living and was politically active in Manchester, where he was primarily in the public eye as Manchester Organiser of the Communist Party of Great Britain. But a poem written nine years after his death also speaks of him as a fighter for Irish freedom. For George proudly retained his Irish identity, enthusiastically participating not only in the Céilí dances of Manchester’s Irish Clubs but in their political activities as well. As a young teenager during Ireland’s War of Independence George, through his family ties, would have remained very much aware of how that War unfolded in his native county. 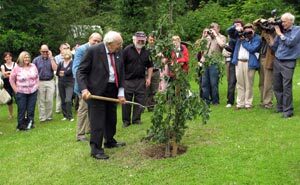 There will indeed be more than an element of poetic justice involved tomorrow when George Brown will be honoured high up above us here at the Olive Grove Memorial to Kilkenny’s International Brigaders in Woodstock Gardens. We might even call it an act of Republican reclamation! For, during the War of Independence, Inistioge’s Woodstock House, with its commanding views of the surrounding countryside, was the headquarters for the whole of the South-East region of Ireland of Britain’s Army of Terror, the RIC Auxiliaries. So bad was their behaviour that their first commanding officer, Brigadier General Crozier, resigned in protest at their ever-escalating atrocities, and he would later accuse the British Government of trying to impose Fascism in Ireland. And yet the people of South Kilkenny defied those Woodstock Auxies. A few miles downstream from here, by the River Nore itself at Glensensaw, Annette’s grandfather, Martin Hennessy, risked everything right under the very noses of the Auxies, as he provided a safe-house, not only for his fellow Kilkenny members of the IRA, but also for national leaders like Dan Breen and Liam Lynch. And it was, beyond the shadow of a doubt, very much a case of risking everything, as the Auxie torture chambers of Woodstock House could have testified. Hennessy family childhood memories well recalled the moment of sheer terror as the bayonets of a military search-party prodded haystacks, but mercifully not the precise haystacks where IRA volunteers were indeed hiding! It was also a first cousin of Martin Hennessy’s mother, the Thomastown hurler Nick Mullins, who, along with his fellow South Kilkenny volunteer Sean Hartley of Glenmore, would be the very last Kilkennyman to fall during our War of Independence, when killed in action at the June 1921 Coolbawn ambush that was fought out in the North Kilkenny coalfields of Castlecomer. This weekend the traditions of both North and South Kilkenny are once again brought together as we commemorate this county’s four International Brigaders – the two Castlecomer mineworkers, Seán Dowling and Michael Brennan, and the two Ballyneale brothers, Michael and George Brown. Just as Thomastown’s Nick Mullins had given his life in order to defend the democratic will of the Irish people, as expressed in the General Election of December 1918, so seventeen years later would his neighbour’s child, George Brown, give his life in order to defend the democratic will of the Spanish people, as expressed in their General Election of February 1936. “June 30: At 9pm received the order to ‘stand to’. July 4: Left for the front…. July 6: Attack started at 5.00am. Fascists in rout at 9.00am. July 7: Mick Kelly killed. Advancing steadily, took the village of Villanueva de la Cañada. July 9: Fascist counter-attack today. Got as far as our lines but driven back with heavy losses on both sides. Johnny Power and Paul Burns wounded, both in the legs. Our Battalion Commander Law killed. Our great Spanish comrade Humanes was also killed besides many other comrades. Just heard of the death of George Brown, our great comrade of the British Communist Party. His unit was met by an advancing group of civilians, including women and children, from the village of Villanueva de la Cañada. Not knowing that these civilians had guns to their backs and were being used by a party of Fascist troops behind, the International Brigaders were subject to surprise attack. And as he lay wounded on the road, George Brown was knifed to death by a Fascist. From the houses and the rooms of your lives. And to a day which has not yet come. This is to-day: a bad day, a day of dying. To-day it is very hot. To the north – look closely! Brunete. Nearer, nearer, a cluster of white houses, open; Villanueva de la Cañada. Dust and thirst and a surge. On the crossroads in Spain. To be more happy, to live. Up the road lorries move, carefully. In extended order, through the dry fields men go, slowly. The sun burns their shoulders. But now they are stilled. You, you are going forward. It is in your fingers, in your stomach, in your aching feet. How hot this day is, those white – white houses! And who is the next man, the man next to you? Staring ahead at the white houses of Villanueva? He turns his face, his eyes – yes. George Brown goes no longer there. No good looking – he’s no longer there. George Brown is no longer George Brown, he is dead. He was killed by the fascists in Spain. A fighter for Ireland’s freedom. Now a dead man in Spain. We know where he played. And we know how he died. On that dust gray road. Perhaps we shall never know who they were. What happened after we must remember. Are a meal for the future. Have new roofs and chimneys. Have nine times grown wheat. That George Brown was killed. Has got into the land. Our fears and our pity. 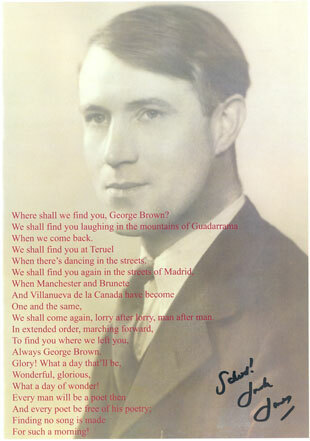 Where shall we find you, George Brown? When there’s dancing in the streets. What a day of wonder! Come back and look around. He did not return from the journey with you. They did not come home. To the rain-swept pavements of Piccadilly. They have been changed for us. Let us remember: nothing stands still. Their jokes, their short caresses. Everything moves, we must be the movers. Everything changes, we must be the changers. Must become a tidal wave. When a star breaks from a star? But of course, George Brown was greatly mourned. And it would be four decades after his death before the new planet of the Spanish democracy for which he had given his life would again see the light of day. 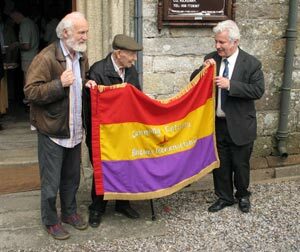 We can, however, truly rejoice that in 1996 Spanish democracy recognised just how much it owed to George Brown and his comrades, when the Spanish Parliament unanimously agreed to confer the right to be given Spanish citizenship on all surviving International Brigaders, among them Jack Jones and Bob Doyle. 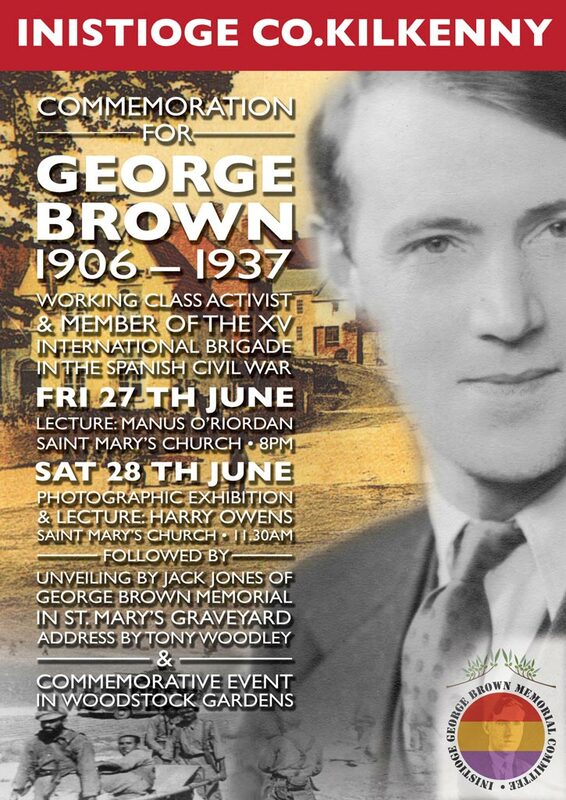 And with this weekend of commemoration we can also rejoice at the fact that, little more than a week short of the 71st anniversary of his death, the spirit of George Brown has at long last returned to his native Kilkenny. BIENVENIDO A CASA, GEORGE BROWN! FÁILTE THAR NAIS ABHAILE, A SHEOIRSE DE BRÚN! 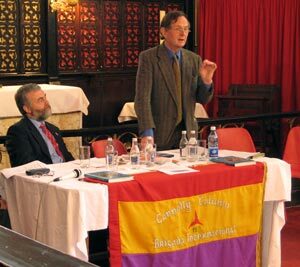 The Chairman, Joe Doyle, then called on the President of the International Brigade Memorial Trust, Jack Jones, to propose the vote of thanks to the lecturer. Jack had been born in Liverpool in 1913 and named James Larkin Jones, in honour of Big Jim Larkin, founder of the Irish Transport and General Workers’ Union (now SIPTU) in 1909. Jack’s docker father had in fact been a good friend of Larkin’s when the latter also worked on the Liverpool docks in the years prior to his departure for Ireland in 1907. In 1921 Ernest Bevin was to bring about a number of union mergers that led to the formation of Britain’s Transport and General Workers’ Union (now UNITE), and Jack James Larkin Jones would himself go on to become the TGWU’s most outstanding post-war General Secretary from 1969 to 1978. Jack Jones was, of course, also an International Brigade volunteer who was wounded while fighting in the 1938 Battle of the Ebro, the last battle in which the International Brigades would take part. Later that year, he would marry Evelyn, widow of George Brown, and they would share sixty years of love and common struggle together. Jack Jones proposed a vote of thanks to Manus O’Riordan for a lecture that had brought the story of George Brown alive in his birthplace. George Brown himself had been engaged in the work of organising the unorganised and Jack Jones also stressed the importance of organising. He concluded by emphasising the lessons of working class unity in the 1930s which now needed to be learned once more for the struggles ahead. 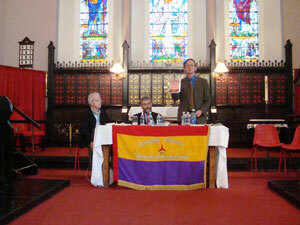 On the following morning, again in St. Mary’s Church, a lecture on the Spanish Civil War itself was given by Harry Owens. Harry was also responsible for mounting the photographic exhibition by Pablo Vazquez Borraga, simply entitled “Defenders of the Spanish Republic”, that was on display in the church entrance during the course of both days of commemoration. The Chairman for this session was Jack O’Connor, General President of SIPTU. He spoke of how great an honour it was to be in the presence of his own great trade union hero, Jack Jones. He introduced Harry Owens as another person with a strong background of trade union struggle, arising from his employment as a night telephonist. 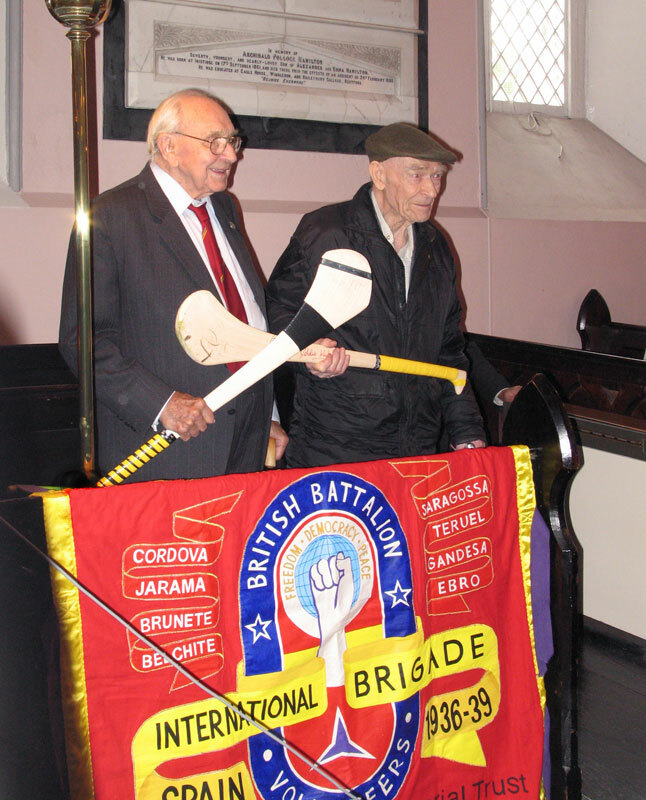 But Harry Owens must be particularly praised for his work in pioneering International Brigade commemorative events in Ireland. 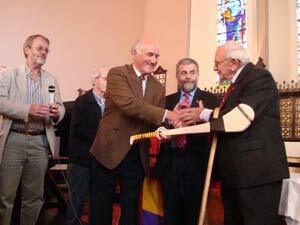 It was Harry who organised a major international conference in Dublin in 1986 to mark the 50th anniversary of the Spanish Civil War. It was also to Harry Owens that credit was primarily due for the Dublin Council of Trade Unions initiative which resulted in the unveiling in 1991 of a Memorial Plaque to all of the Irish International Brigade dead at SIPTU Headquarters in Liberty Hall. Harry had also edited Bob Doyle’s memoirs for publication in two languages: as “Memorias de un rebelde sin pausa” in Spanish in 2002, and “Brigadista” in English in 2006. 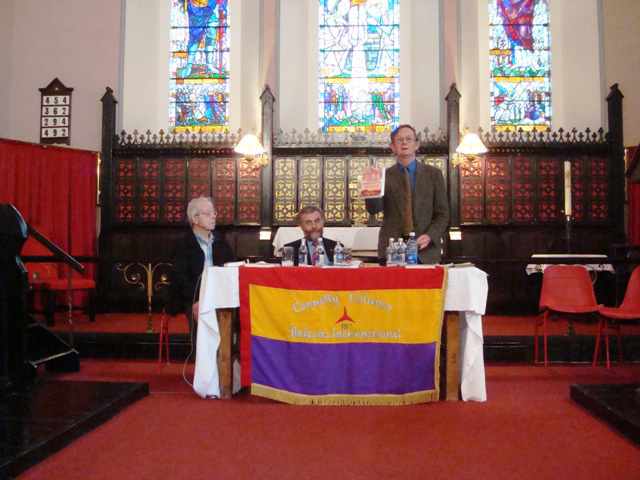 Harry Owens next proceeded to give such a powerful and vivid narrative of so many aspects of the Spanish Civil War that, upon its conclusion, his lecture evoked a prolonged standing ovation from his Inistioge audience. Harry’s lecture was then followed by presentations to both Jack Jones and Bob Doyle, of an autographed hurley stick each, together with a sliotar (ball), by Kilkenny’s outstanding hurling star and six times All Ireland champion, Eddie Keher. 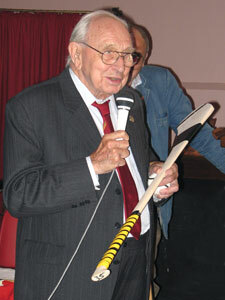 A first cousin once removed of George Brown (on the Brown side of the family), Eddie Keher spoke of how the foundation of the Gaelic Athletic Association, and its promotion of both Gaelic football and hurling, had itself been a blow against national oppression, as George Brown, Jack Jones and Bob Doyle had struggled against oppression internationally. Jack Jones again spoke of how much loved and respected George Brown had been and how powerfully his cherished memory had lived on in his and Evelyn’s home. He would ensure that this Kilkenny hurley would now be proudly displayed in George’s memory at his union headquarters in London’s Transport House. 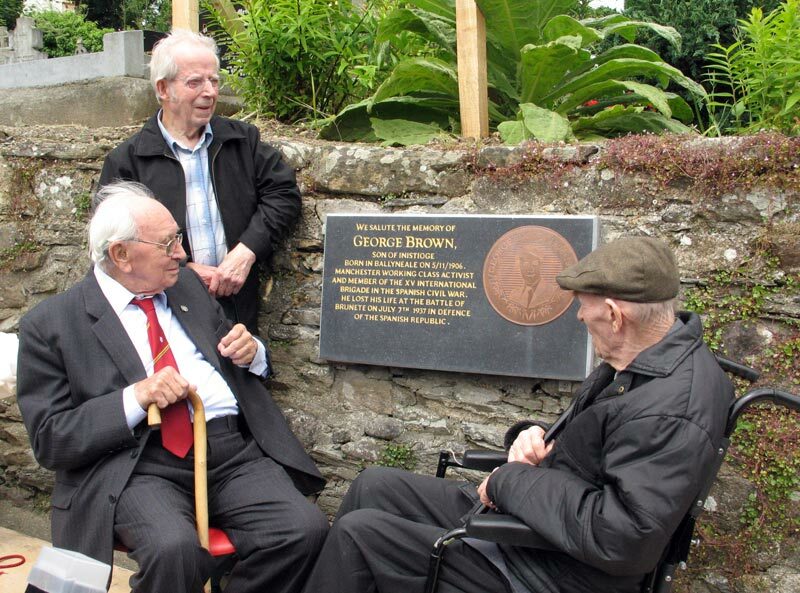 Paddy Murphy (Pádraig Ó Murchú), Chairman of the Inistioge Memorial Committee, presented a George Brown commemorative plaque to Jack O’Connor, who said that this also would have in honoured place in Dublin’s Liberty Hall. The Chairperson of UNITE, Tony Woodhouse, then presented commemorative plaques to two cousins of George Brown, Mrs. Eily O’Brien (neé Keher) and Mrs. Mary Doolin (neé Keher), as well as to Bob Doyle and Jack Jones. BRIGADE IN THE SPANISH CIVIL WAR. 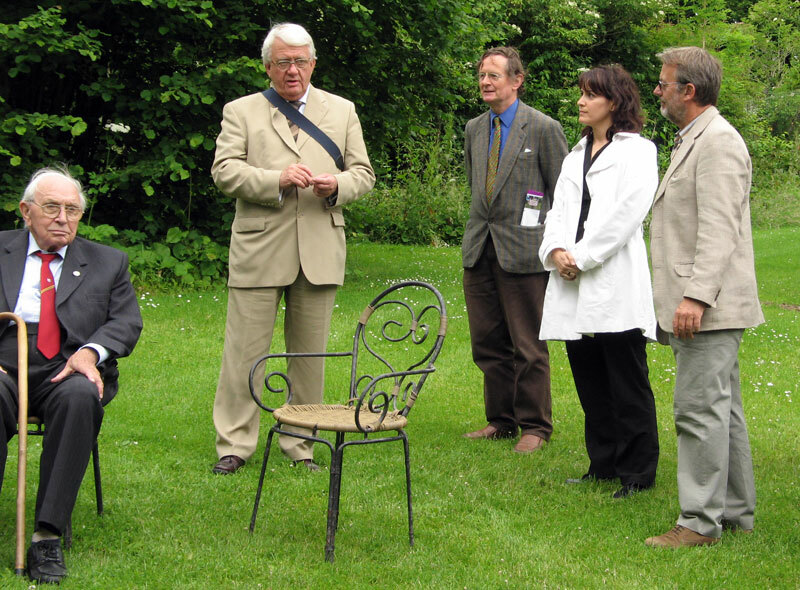 This graveyard ceremony was presided over by Waterford playwright Jim Nolan. 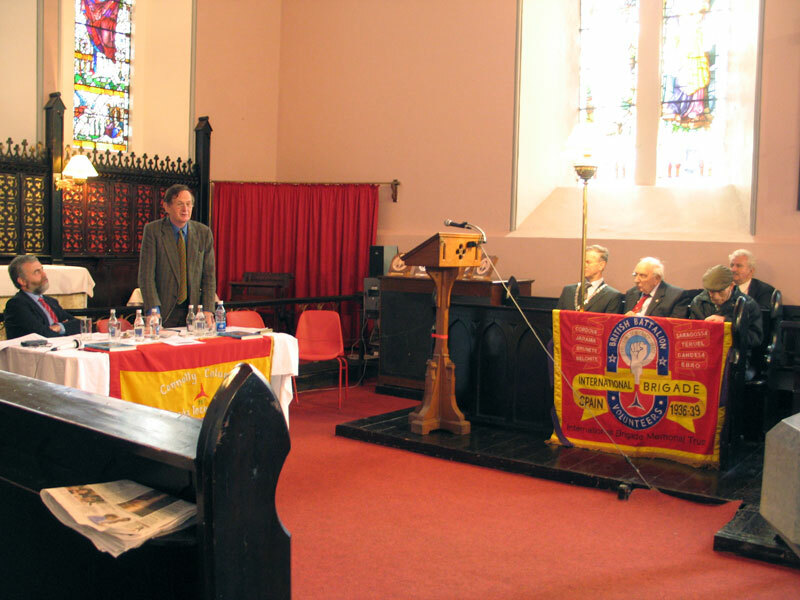 The introduction and keynote address was given by Seán Walsh, Secretary of the Inistioge George Brown Memorial Committee. The oration was delivered by Jimmy Kelly, Irish Regional Secretary and Assistant General Secretary of UNITE. At the graveyard ceremony IBMT executive members Hilary Jones, Pauline Fraser, Marlene Sidaway and Manus O’Riordan carried the Memorial Banners of both the British Battalion and the Connolly Column, 15 Brigada Internacional. The Graiguenamanagh Brass Band, augmented by former members of Inistioge’s own St. Colmcille Brass Band (among whose founders had been a grandfather of George Brown), played the anthem of George Brown’s own County Kilkenny, “The Rose of Mooncoin”, the IBMT anthem, “There’ a Valley in Spain called Jarama”, and the International Brigades anthem, “The Internationale”. The attendance next proceeded to Woodstock Gardens for a tree planting ceremony to mark the occasion of the visit by Jack Jones and his family to Inistioge. This ceremony was presided over by Sean Kelly of UNITE, who had worked tirelessly as the Commemoration Project Co-ordinator. 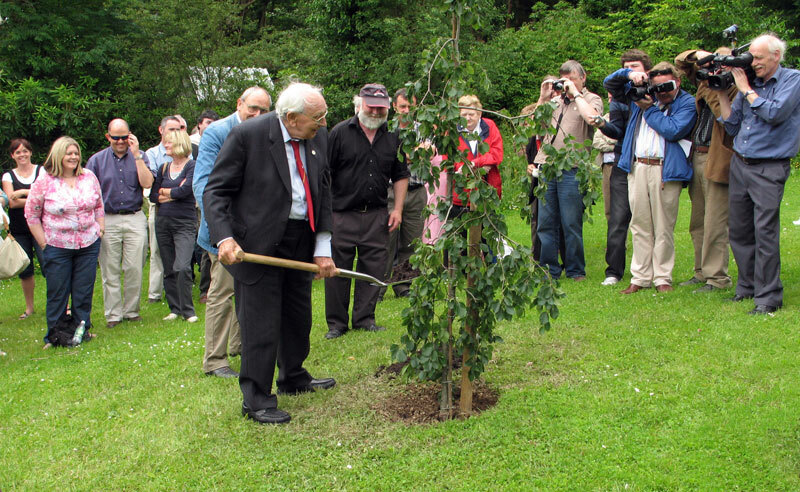 Jack Jones himself planted the tree on behalf of his and Evelyn’s family. 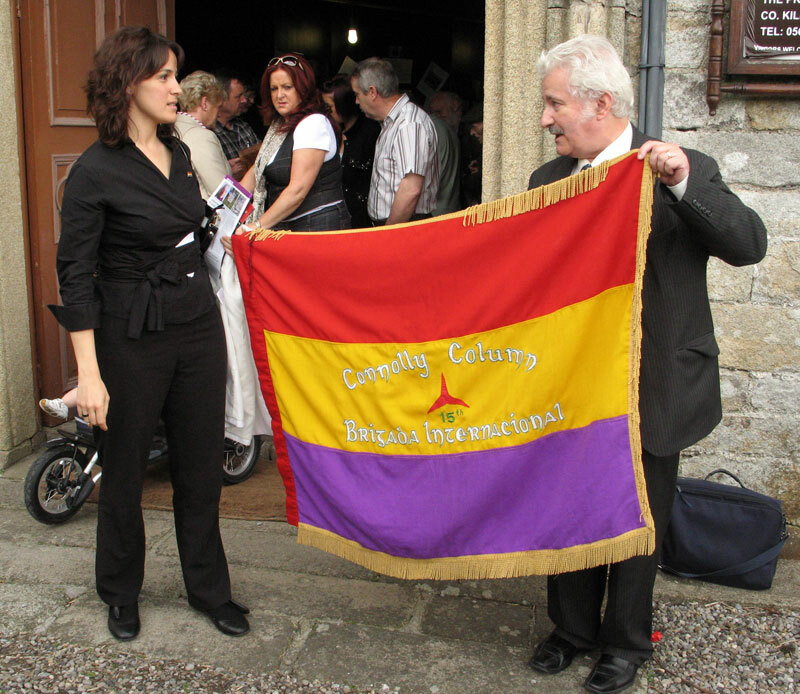 Manus O’Riordan read out the roll of honour of all those Irishmen who had given their lives in defence of the Spanish Republic, while Spanish historian Lidia Bocanegra thanked International Brigaders on behalf of democratic Spain’s new generations. At the Woodstock Gardens Olive Grove Memorial to Kilkenny’s International Brigaders, a presentation of a life-long achievement award to the George Brown Memorial Committee Chairman Paddy Murphy, in recognition of his promotion of the commemoration of George Brown over a 50 year period, was made by his life long friend and comrade Seán Garland. A further presentation was made by Andy McGuinness of SIPTU, in recognition of Paddy Murphy’s lifelong activist service in the Federation of Rural Workers component of SIPTU. 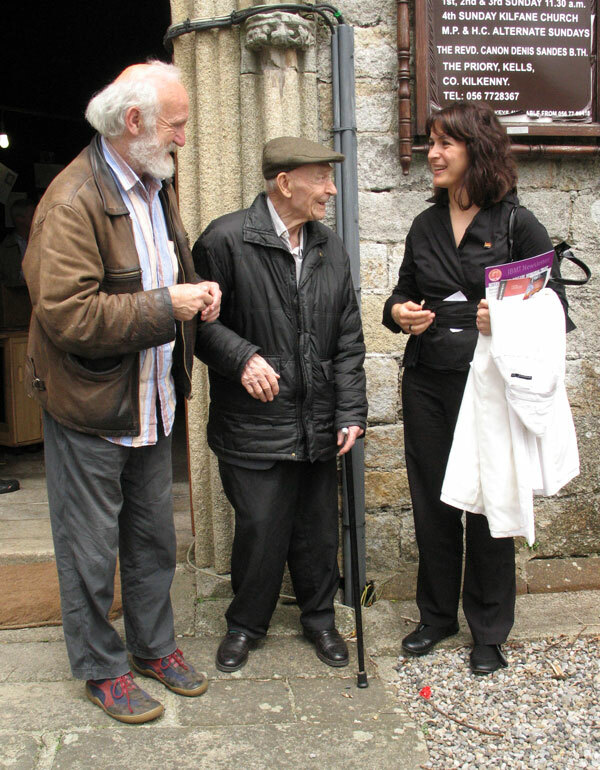 Inistioge’s “Hatchery Folk Group”, led by Terry Bannon, provided a musical tribute, which included Christy Moore’s song “Viva la Quince Brigada!”, sung with two additional verses in memory of George Brown that had been written by James “Shamur” Kelly. A recital on the Irish harp was performed by Brenda O’Riordan, which included “Marbhna Luimnighe” (“Limerick’s Lamentation”), the lament which she had played at the May 2006 funeral of her father, International Brigades veteran and “Connolly Column” author Michael O’Riordan, and which had also been played on the pipes at both the June 1979 Dublin reburial of the remains of Irish International Brigade leader Frank Ryan and at the October 2005 IBMT Frank Ryan Commemoration. - incl. Inistioge interview with Jack Jones on George Brown.